This casual contemporary style of this five-piece dining set offers fabulous dining options for a breakfast nook or kitchen. The tapered legs of the rectangular dining table and four side chairs with vertical slat backs create a great casual dining space for daily meals, homework, and more. The simple and sophisticated style looks great in any decor. Available in a handsome Espresso finish. The Brody Casual Contemporary Five Piece Dining Set by CM at Michael's Furniture Warehouse in the San Fernando & Los Angeles area. Product availability may vary. Contact us for the most current availability on this product. 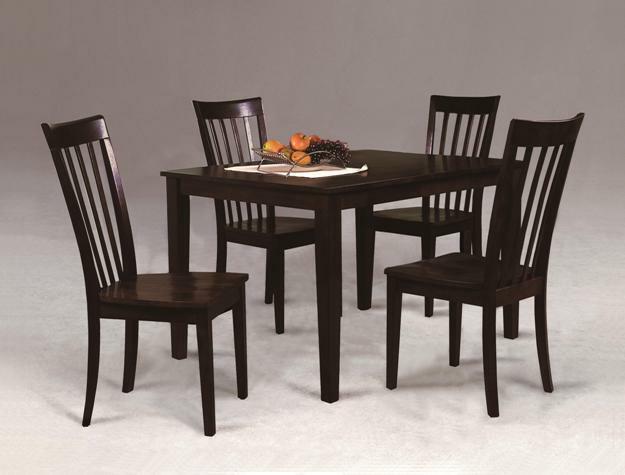 This casual contemporary dining room set is the perfect addition to a kitchen or breakfast nook. Gracefully tapering legs on the table and side chairs add to a relaxed aesthetic that will fit right in at any home. The Brody collection is a great option if you are looking for Casual furniture in the San Fernando & Los Angeles area.